p>Made from flexible spring grade stainless steel this Original Style Rockwell SoniCrafter Fitting blade cuts surprisingly fast through wood and other non-abrasive materials. This blade is your multi-tool surgical scalpel. It cuts wood and plastic quickly and minimizes on cutting disturbances to the surrounding area. A very operator friendly blade due to its guidable nature. 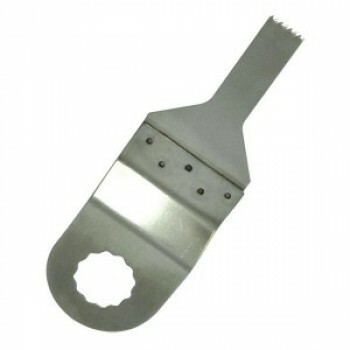 This stainless steel clean cutter is excellent for use in and around finished trim and moldings. This blade is ONLY compatible with the Original Style Rockwell SoniCrafter and the Original Worx SoniCrafter. This blade by design is also fully compatible with the Shop Series RCS5100K Sonic Tool, Ridgid JobMax, Ryobi JobPlus, The Renovator, Challenge Xtreme, Draper, Parkside PMFW 280 A1, Smart SMT250, Task Force and the AEG oscillating multi-tools. The R005 SoniCrafter Stainless Steel blade is your multi-tool surgical scalpel for making precision cut-outs in finished or unfinished wood, plastic or laminates.